The trade talk between the US and China is approaching a temporary truce, whereas such progress has helped dismiss the global economic uncertainty to some extent. The Taiwan Institute of Economic Research (TIER) issued its most recent composite indicators for manufacturing and service. The manufacturing indicator goes up due to the international optimism in resolving the conflicts between the US and China. Nevertheless, the service indicator goes down because of fewer working days when cerebrating the lunar new year in February 2019. Taiwan's exports in February 2019 decreased by 8.77% compared with the same month of 2018. Regarding imports, Taiwan's imports in February 2019 decreased by 19.7% compared with imports in February 2018. On the cumulated basis, exports and imports of January and February this year gave a trade surplus of US$ 5.83 billion or decreased by 4.09% on a y-o-y basis. Taiwan's consumer price index (CPI) increased by 0.23% in February 2019 compared with the same month of previous year. The core inflation rate excluding prices of the energy and food grew by 0.30% in February 2019. In addition, the wholesale price index (WPI) moved up by 0.80% in February 2019 on the year-on-year basis. As for exchange rate, the NTD similar to all other major currencies in the world went somewhat weaker due to the relatively stronger USD. The NTD/USD stood at 30.775 in late February 2019 indicating a 0.11% depreciation. Regarding the interest rate, it remained low and steady in February 2019 due to the continued loose monetary operations by the CBC with respect to the most recent CPI reading and potential global uncertainties; the lowest and highest over-night call rate in February 2019 stood at 0.176% and 0.194% respectively. The portion of manufacturing firms who perceived business were better than expected in the target month was 11.5% or decreased by 19.6 percentage points compared with respondents who perceiving better business in the previous month. The portion of those perceived business were getting worse in the target month was 47.3% or increased by 16.5 percentage points than 30.8% perceiving worse business of the previous month. The portion of manufacturing firms who perceived business remained constant in the target month was 41.1% or increased by 3.0 percentage points compared with 38.1% perceiving constant business in the previous month. Overall, manufacturing firms perceived the business in the target month was more pessimistic than the previous month. In addition, the portion of manufacturers who perceived business would be better in the next six months was 43.1% in the target month or increased by 12.5 percentage points than 30.6% feeling more optimistic about the future in the previous month. The portion of firms who perceived the economic outlook would be worsening was 9.9% or decreased by 8.4 percentage points compared with 18.3% feeling rather pessimistic about the future in the previous month. The portion of manufacturing firms who perceived business remained constant in the next six months stood at 46.9% or decreased by 4.2 percentage points compared with 51.1% feeling neutral about the business outlook one month earlier. Overall, manufacturing firms perceived the business in the near future was more optimistic than the previous month. The manufacturing composite indicator for February 2019 adjusted for seasonal factors on moving average, saw an upward correction, and from a revision of as 89.68 points in January 2019 moved up to 91.29 points. Figure 1 shows an increase of 1.61 points, the third month of consecutive increase. The TIER service sector composite indicator for February 2019 adjusted for seasonal factors on moving average, saw a downward correlation, and from a revision of as 92.26 points in January 2019 moved down to 92.05 points. Figure 1 shows a decrease of 0.21 points, the first dip after two-month consecutive increase. 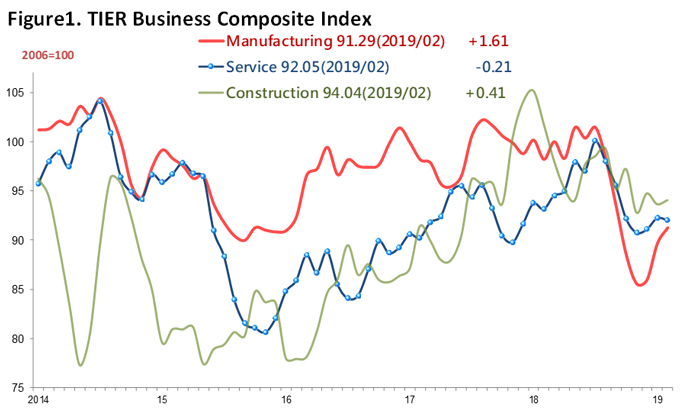 In addition, the TIER Construction Sector Composite Indicator for February 2019 adjusted for seasonal factors on moving average, saw an upward correction, and from a revision of 93.60 points in January 2019 went up to 94.04 points. Figure 1 shows an increase of 0.41 points, the first mount after a one-month decline. Yarn Spinning Mills, Industrial Chemicals, Petrochemicals Manufacturing, Porcelain and Ceramic Products Manufacturing, Glass and Glass Products Manufacturing, Fabricated Metal Products Manufacturing, Metal Dies, Screw, Nut Manufacturing, Machinery and Equipment Manufacturing and Repairing, Cutlery and Tools Manufacturing, Industrial Machinery, Data Storage Media Units Manufacturing and Reproducing, Motor Parts Manufacturing, Motorcycles Parts Manufacturing. Chemical Products Manufacturing, Cement and Cement Products Manufacturing, Electric Wires and Cables Manufacturing, Electrical Appliances and Housewares Manufacturing, Audio and Video Electronic Products Manufacturing, Banks, Insurance. Food, Slaughtering, Edible Oil Manufacturing, Flour Milling and Grain Husking , Soft Drink Manufacturing , Prepared Animal Feeds Manufacturing, Textiles Mills, Fabric Mills , Leather, Fur and Allied Product Manufacturing, Plastics and Rubber Raw Materials, Man-made Fibers Manufacturing, Rubber Products Manufacturing, Plastic Products Manufacturing, Non-metallic Mineral Products Manufacturing, Iron and Steel Basic Industries, Metal Structure and Architectural Components Manufacturing, Electrical Machinery, Electronic Machinery, Electronic Parts and Components Manufacturing, Motor Vehicles Manufacturing, Bicycles Parts Manufacturing, Retail Sales, Wholesale, Telecommunication Services. Petroleum and Coal Products Manufacturing, Motorcycles Manufacturing. Manufacturing, Frozen Food Manufacturing, Apparel, Clothing Accessories and Other Textile Product Manufacturing , Wood and Bamboo Products Manufacturing, Paper Manufacturing, Electrical Machinery, Supplies Manufacturing and Repairing, Communications Equipment and Apparatus Manufacturing, Transport Equipment Manufacturing and Repairing, Bicycles Manufacturing, Education and Entertainment Articles Manufacturing, Construction, Basic Civil Structure Construction, Real Estate Investment, Securities, Transportation and Storage.